Talks on the crisis in Central African Republic began Wednesday with representatives of the government, rebels and other groups gathering in this nearby country, said Gabonese government officials. Several different groups from Central African Republic gathered for the talks including the Seleka rebels, led by Michel Djotodia, representatives of President Francois Bozize's government, the political opposition and civic organizations. Also present were several ministers of the 10 countries in the Economic Community of Central African States. The rebels have seized control of a dozen towns and cities in northern Central African Republic, confronting Bozize with the most serious challenge to his rule since he came to power through a coup in 2003. He has since won two elections in 2005 and 2011. Officials say the talks are about the revision of a peace agreement signed in 2007 but the rebels have stated they want the talks to be about the resignation of Bozize. While the rebels are demanding that Bozize step down from power, the president Tuesday spoke to the press in Central African Republic's capital, Banjul, and made it clear that he intends to stay in office. "Why negotiate?" said Bozize to Radio France International. "Does the rebellion represent the Central African people who have elected me twice? What have I done wrong? I do my job. A rebellion that is growing brutally, that is attacking us. No, I have nothing to negotiate. If I did, the law of the jungle would prevail. And could it spread elsewhere, even to developed countries." Bozize reiterated his offer of bringing the rebels into a coalition government. "We are ready for a national unity government," said Bozize to RFI. "In our current government, there are members of the opposition. So for us, it would be nothing new, it's something we've always done." Bozize dismissed the Seleka rebels as terrorists. "If the terrorists come to talk terrorism, the whole world will know it," he said at a press conference Tuesday. "If they come to discuss defending the cause of Central African Republic, we are going to listen to them. If there is something positive, we will accept it. If it's armed robbery, we will not accept it." The rebels of the Seleka alliance come from four separate groups that have now joined forces against Bozize's government. On Tuesday, the president again accused outside forces of aiding them and said "there is a risk that a religious cause is behind Seleka." He said it appeared there were Janjaweed, or fighters from neighboring Sudan, along with "people who don't speak Sango, French or even English" from beyond the country's borders. "Foreign terrorists are attacking the established power in Central African Republic. Under those circumstances, I am proud of having served my country normally, that democracy is functioning normally," he said. Seleka began its offensive Dec. 10, and the rebels have seized 12 towns in a month's time. 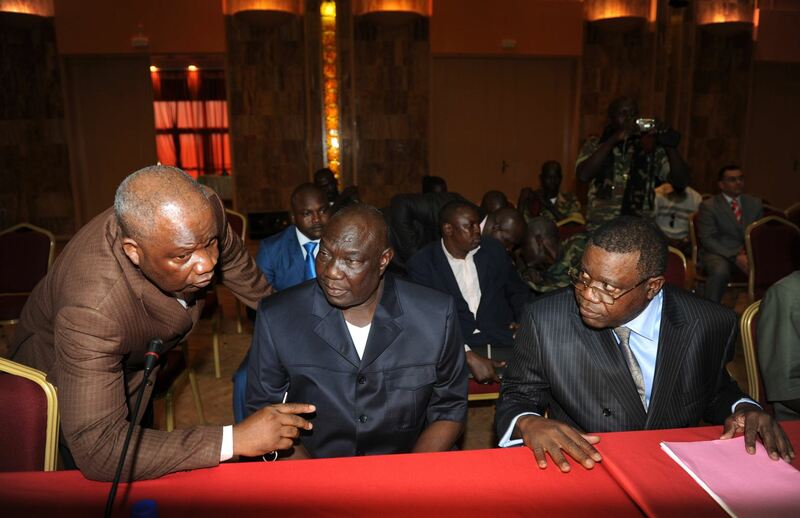 They said they were halting their advance before reaching Bangui in an attempt to give the peace negotiations a chance. However, a spokesman for Seleka in Paris warned earlier this week that they still had the strength to attack the government-fortified city of Damara as well as Bangui. "If we wanted to take Damara, it would already be done. We have the means to take Damara and also to take Bangui today, but we don't want the capital to suffer attacks," rebel spokesman Eric Massi told The Associated Press in Paris on Monday. The rebels behind the most recent instability signed a 2007 peace accord allowing them to join the regular army, but insurgent leaders say the deal wasn't fully implemented. They have claimed that their actions are justified in light of the "thirst for justice, for peace, for security and for economic development of the people of Central African Republic." Despite Central African Republic's wealth of gold, diamonds, timber and uranium, the government remains perpetually cash-strapped. The land-locked nation of 4.4 million, a former French colony, is among the poorest countries in the world.